How do we remember persons, objects, events? Memory seems so personal, but, at the same time, it is shaped by collective experience and public representations. Newspapers, television, and even celebrations and festivities mark for us not only who we are, but also who we were and how we lived. 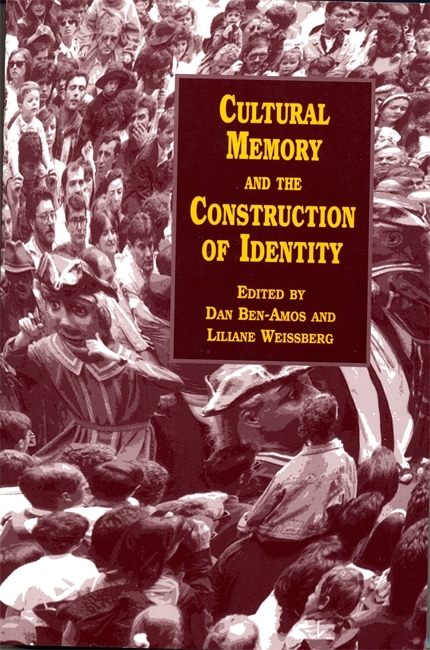 Cultural Memory and the Construction of Identity brings together scholars of folklore, literature, history, and communication to explore the dynamics of cultural memory in a variety of contexts. The authors show how memory is shaped and how it operates in uniting society and creating images that attain the value of truth even if they deviate from fact. They point to the relationship between this memory and our notion of "culture." They also discuss this cultural memory on the level of everyday life. Building on research in the field, their contributions clearly show that cultural memory has become the creative invention of the past in service of both the present and an imagined future. Dan Ben-Amos is a professor of folklore and folklife at the University of Pennsylvania. He is the editor of MIcha Joseph Bin Gorion’s Mimekor Yisrael: Classical Jewish Folktales. Liliane Weissberg is a professor of German and comparative literature and holds the Joseph B. Glossberg Term Chair in the Humanities at the University of Pennsylvania. She is the editor of Hannah Arendt’s Rahel Varnhagen: The Life of a Jewess.